Friday the 13th was the beginning of my new life. It was June of 2008 when my boyfriend Aquila and I left Montreal to go WWOOFing across Canada. 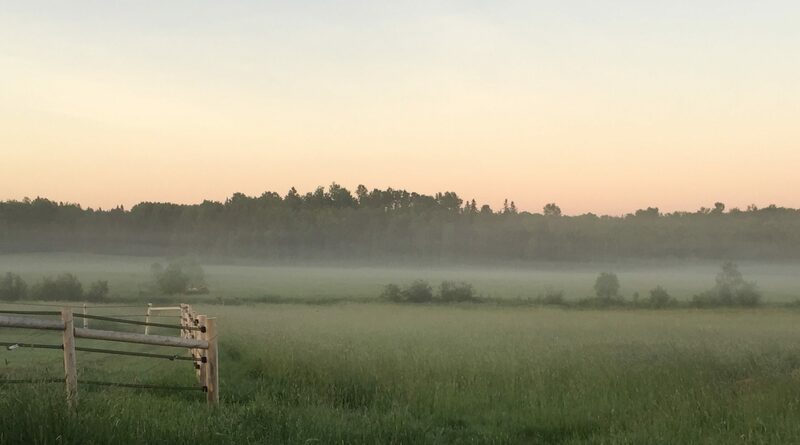 Our first chosen farm destination captivated me with its description of horses, vegetable gardens, and maple syrup, but the promise of equines guided my soul. Nestled in magnificent cottage country near Rosseau Lake in the Muskoka regions of Ontario, my first steps on the farm were a waking dream. The horses were exactly how I imagined: majestic, intelligent, athletic, beautiful and inspiring. I, on the other hand, was not at all how I imagined: I was afraid. They were so BIG! I felt slow, unsteady, unsure of myself, and very vulnerable. There were 24 horses at the farm when Aquila and I arrived, each with their own personalities, gifts, and challenges. I appreciated their gifts from afar, but I was very challenged up close. My heart was connected, but my body and mind betrayed me. I tried not to let it show, but the horses were never fooled; they knew exactly how I felt and treated me accordingly. In their pecking order, I was not a dominant, a leader, or even a friend. I was a fly, an annoying fly, trying to coax them into following me. This became most apparent one day trying to lead a particularly pushy horse outside. Ace spotted something in the distance and decided to rear. I managed to keep hold of the lead line and avoid his hooves as they slammed down in his display of power. I felt quite proud! I can handle you, I said to myself. Just as the thought left my mind, Ace showed me the truth. He bolted, dislocating my shoulder in the process, and knocked me to the ground. At that moment, I had two choices. Stand up, hobble away, blame Ace for being badly behaved, and carry my fear of horses perhaps forever. I chose option two. Stand up, pop my shoulder back into place, look inward, and keep learning. What was your big turning point? I would love to know, leave me a comment. This is part of an ongoing story, click here to start from the beginning! I post every two weeks – please subscribe and share! definitely my discovery of itinerant rogue cells… difficult, but life awakening. Wow, yes. What a great way to put it too. My turning point with fear and horses was with a particularly bucky and athletic thoroughbred I was riding as a teen. One day when her and I were out hacking along, she started bucking and instead of freezing up and going into the fetal position I told myself “you can do this, just ride through it.” I did and after that I had a new confidence in myself that hadn’t been there before. Looking back I am sure that the confidence lended itself not just to horses but to life In general. I love reading your blog posts here. Hmmm, my turning point came about 4 years ago when I realized I could no longer ride horses due to physical health reasons – I loved them…did all the ‘show’ stuff when I was younger…fell off more times that I can remember – but now, my rescued boy Tango (also unable to BE ridden due to health reasons) was looking to me to love him and keep him safe….and all I knew was how to ride and get them to do what I wanted to win ribbons…eeeks!! Until I happened across and article talking about Natual Horsemanship, and learning the subltle art of speaking to them – BAM!! My whole world has changed … My life and experiences with Tango has been a huge turning point in my life…thank you Lord for bringing us together, I’m loving every moment of this new ride!